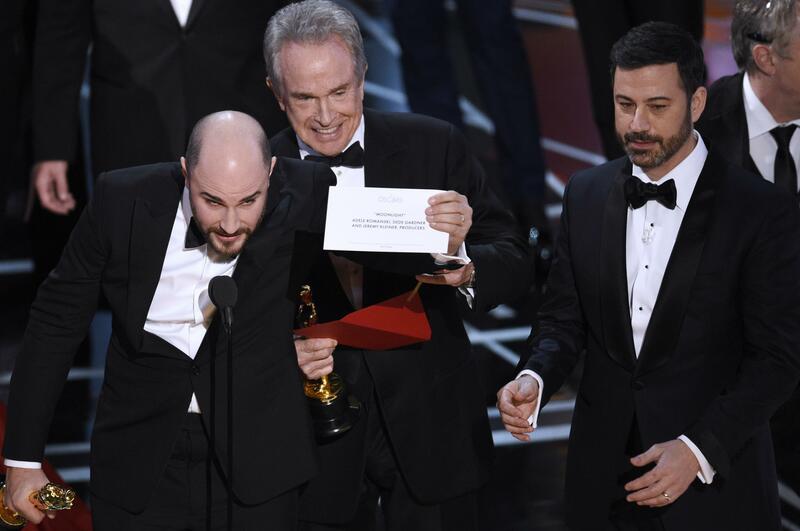 UPDATED: Mon., Feb. 27, 2017, 8:41 a.m.
After the Oscars’ big best picture mix-up Sunday, Emma Stone said backstage that she was holding her lead actress card when “La La Land” was incorrectly announced as best picture. So how could Warren Beatty and Faye Dunaway have been looking at that very same card, as the actor explained to the audience? “In an undisclosed location, the partners tabulate votes and stuff two sets of winning envelopes, partly as another security measure and also to aid the show’s flow. Stationed with their signature briefcases on opposite sides of the stage, either (PricewaterhouseCoopers partners, Brian) Cullinan or (Martha) Ruiz can dispense envelopes to presenters. At the end of the evening, each accountant will have given out about half of the envelopes. Published: Feb. 27, 2017, 8:36 a.m. Updated: Feb. 27, 2017, 8:41 a.m.